Taking in the bird’s eye view of the ’09 backyard, it looks nice; also controlled, interesting. I recall feeling I wanted more — plants, containers, rocks, decorative items, more stuff! So, over the next few years I spent lots of time and money gathering all of those things and more. All along spending much time stacking, arranging and moving those things around and around, until 2011 when we ended up on our local garden tour. But once that moment of notoriety had passed a restlessness set in and I wanted new again. I decided everything had to go. Sales ensued, stuff was got rid of and I began to bandy about ideas for a new scheme … Then, as regular readers know, my health issues made themselves known and everything stalled, all plans eventually coming to a halt. Now here we are, it’s almost the end of 2013 and I’m still trying to get to that place where I can truly start over. Yes, I’m still trying to get rid of things even now, still trying to roll back to zero. These large concrete containers, for instance, came to us in ’09 (you can see them in the previous photo) and it was strange to see them packed onto a trailer the other day, leaving us for good. 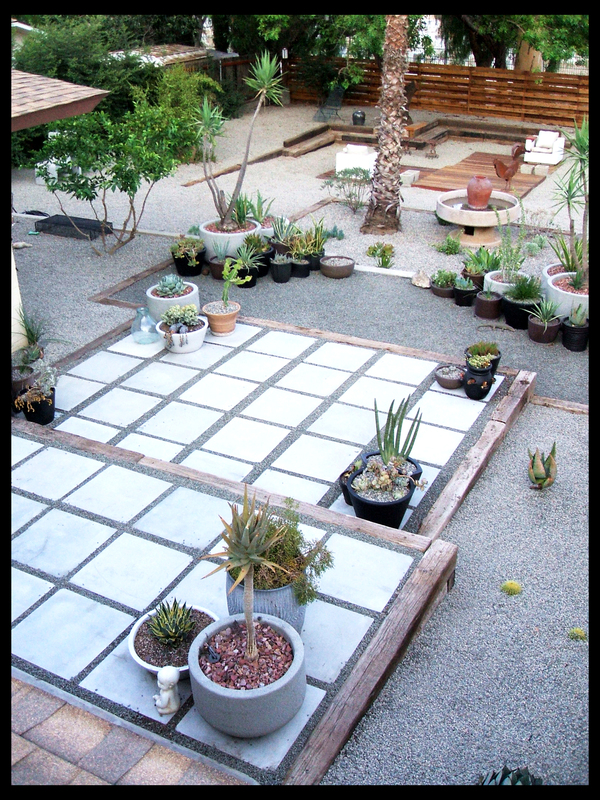 They’d occupied different spots in our backyard for 4-plus years and housed various large succulents and other plants; they were fixtures. 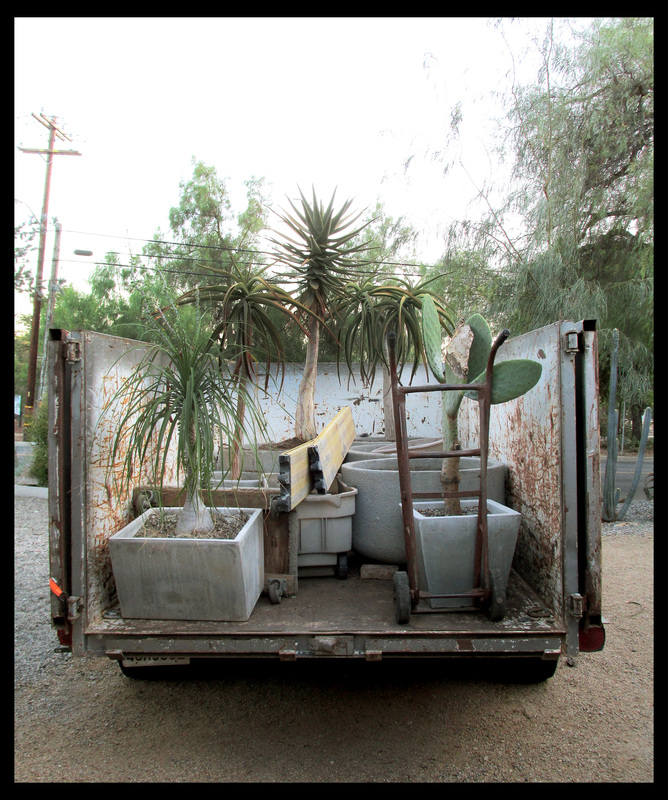 The loaded trailer was left in our driveway until the next day and from the house I could see our plants peering over the fence from the wrong side and I felt a pang; I mean where were they going next? 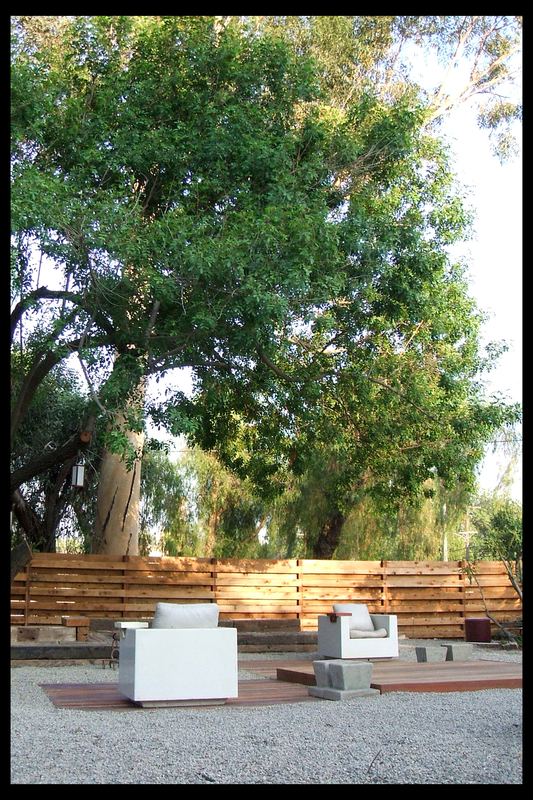 The next day I realized I’d moved on when I found myself relishing the now-open spaces the containers used to occupy. I’m ashamed admitting that there’s still plenty of things that need to go, but I swear I’m making headway finally. Things — heavy things — have been given away and some have already gone, while others are just awaiting their tow-away; still others can be found at Vintique Alley, here in Riverside, a perfect venue for my overflow. How is it that I have yet more things if I’ve been actively divesting for years now? All I can say is: Once a hunter-gatherer, always one … and, I’m better but not perfect. And what of my new scheme, my plan for a new garden? It’s in my head. But it feels a lot like 2009. Wow, Guida, thanks for such a great commment. We humans are strange, I’m definitely proof of that statement … tracking down these old pictures I could only marvel at all I have given away, sold, whatever. Thank God for photography! By documenting all I’ve had — and done — it’s with me forever. As I read your words I found myself wondering if/when I would be going down this same road. The time is growing near when I must begin the annual migration of containers from their summer home on the patio to covered and interior locations for the winter. I am not looking forward to it. How long will I keep up this insanity? Hi, Loree, whenever you’ve mentioned your container migration I’ve marveled at your dedication … I don’t think you’ll be stopping any time soon, though, you love those plants too much! I totally don’t get it but then I’m not an artist. I love all your creations and wish you would create something on my property in Scottsdale. Guaranteed it would stay for my lifetime. Paul did a quicky redo on my atrium in the middle of the house and it too will stay as is. Take care, bros!! You’re amazing! Do understand the process of change in our gardens. What fun it can be. And I do understand not changing. I have areas that change and others that don’t. And with Tom always dragging home more “yard art”. But it’s fun and keeps me entertained. And sometimes I can sell something. With folks like you to give inspiration, who knows where we can take our home enviroments. Even famous painters would sometimes paint over an existing canvas. The truth is, Reuben, your creativity knows no BOUNDS, so you can’t stand it when a garden space is no longer a project. It will either kill you or keep you young! I’m workin’ on it, JR, I’m just hoping I land on the young side, again!